I just stumbled across your videos last night when I was on Pinterest and I’m so glad! I am a quarter Czech, but I have never been taught any authentic recipes. I’m making a meal for my mother tomorrow and am wondering if I can make the dill sauce today and serve it tomorrow. Will it still taste good? Also, I’m hoping to make your kefir cake. Do you think it’d be okay to make that tonight and serve tomorrow? Most of the czech dishes are even better the following day. Especially sauces – seasoning and flavours blend together better also meat is tender. It is common to cook more servings at once and then eat it for 2-3 days. Czech cuisine is usually more time consuming therefore you do not cook sauce with meat every day but it can be safely eaten after several days unlike for example Italian one that is often fast but you would not like to reheat any dish and eat it following day. where do you buy your dumplings? or do you make them? if you make them do you have a recipe? thank you! I did not like Koprova Omacka when I was a kid. I did crave it once a few months ago and tried this recipe. My Dad said it was even better then his Mom used to make and that is a huge compliment!! I liked it as well and my boys loved it and requested it again. I’ve made it twice so far! Oh wow! That is a big compliment! I am honored! Thank you Eva for your wonderful comments! I am not really sure, but I don’t think it would work with fish. You can definitely try and see if you like it. That looks absolutely delicious! 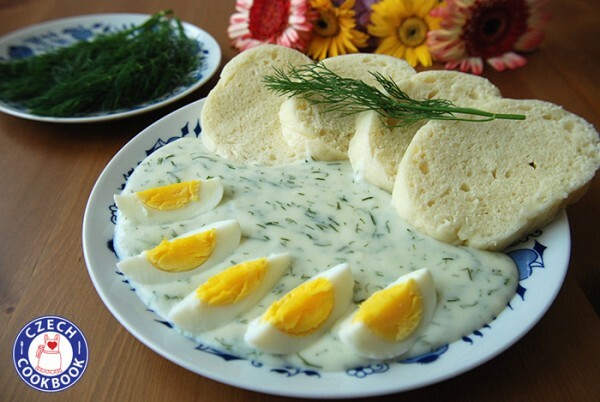 I’ve never been able to make my knedlíky come out quite right, but I MUST try this with noky, which I make often, (By the way, we Greeks are crazy about dill!). Do the Czechs make a similar bešamel with mushrooms? I often do that with the very same method and seasonings as you did and pour it over noky. Great comfort food!